Turkeys abound this time of year, here’s a craft that pops right up to wish kids a Happy Thanksgiving! Print out the two pattern pages on a heavy paper, like card stock or construction paper. Using a ruler as a guide, take the rounded end of a paper clip (or a ballpoint pen that has run out of ink) and press along the dotted line on the center of the card. Go all the way from the top to the bottom of the card! Then do the same thing with all the dotted lines on the pattern pieces. 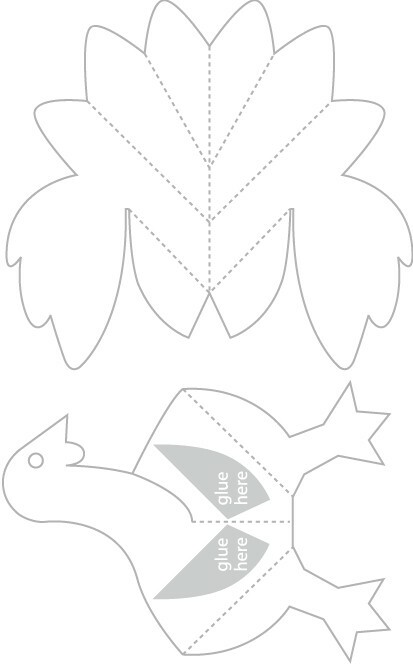 Carefully cut out the turkey's card and the pop up pieces following the solid, black lines. Take hold of the tab at the bottom of the feathers.. and fold upwards. Return the tab to its original position. Repeat with the second tab at the bottom. Take hold of the upper section of feathers and fold backwards. Take hold of the very top section of feathers and fold forward. Look at the photos below and see how you are progressing. Take the turkey and fold the body in half along the center fold line. The center fold line should be moving away from you and the outer edges of the turkey should be coming towards you. Take hold of the leg tab at the left side of the turkey and fold it back away from the body. Do the same with the right side. Turn the turkey piece over. It should have the head and neck, as well as the leg tabs, coming forward. Turn the turkey back over again and apply glue to the areas marked "glue here." Take hold of the feather piece and carefully align the tabs with the glue areas on the turkey. IMPORTANT: Make sure the outer parts of the feathers go IN FRONT of the turkey's body as indicated by the red arrows in the photo below. Press the feather piece firmly into the glue so both pop-up pieces are flat. Make sure the outer parts of the feathers come in front of the turkey as shown. Take the card and fold it in half along the center fold line. Crease well, then open again. Apply glue to the areas marked "glue here." Take the turkey and align the leg tabs with the glue areas... and press the turkey onto the card. The turkey should lay completely flat when applied to the card. Let the glue dry! After the glue has dried, carefully close the card. Your pop-up Thanksgiving card is finished! It looks good enough to eat!